God's Faint Path › Does your Identity limit Spiritual Growth? Does your Identity limit Spiritual Growth? I have an iron will, and all of my will has always been to conquer some horrible feeling of inadequacy...I push past one spell of it and discover myself as a special human being, and then I get to another stage and think I'm mediocre and uninteresting....Again and again. My drive in life is from this horrible fear of being mediocre. And that's always pushing me, pushing me. Because even though I've become Somebody, I still have to prove I'm Somebody. My struggle has never ended and it probably never will. Barna Group: Can you explain your concept of the “Cycle of False Identity”? How can a person break this cycle? Cavanaugh: The cycle of false identity begins with being in a family where the parents are not very self-aware, and there are unfounded expectations placed on the children. When the children fail to meet those unfounded expectations the parents begin to judge them in their failure. The more we try to meet these unfounded expectations, the more we begin to lose our authentic sense of self. We can begin to feel like we are somehow defective—we are not good enough, smart enough, hardworking enough. Our whole sense of identity becomes distorted. The process of breaking the cycle of false identity is an equipping process. The Greek word for equipping means to restore, to complete, to perfect. Restoring a person back to God’s original design is a critical part of breaking the cycle. We want to create a cycle of authentic identity. This begins with creating self-awareness by helping each person rediscover their gifts and talents. And as they receive those gifts and talents with a grateful heart, it produces true humility, which produces authenticity—and from the authenticity, love and service arise and their light begins to shine. 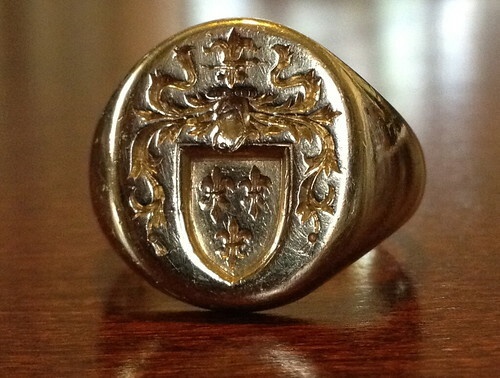 This ring is engraved with the Burch family coat of arms. Genie gave it to me on our 15th Anniversary. An old maid aunt wrote up four volumes of family geneology, which my father paid to publish. She tracked us back to the Middle Ages. Much of my identity comes from the idea of family extending back centuries. Yet, I've come to learn that where we place our identity is critical to any hope of growing to spiritual maturity. I spent several years studying structural consulting with Robert Fritz. I was certified to do this work with organizations, but find the most powerful expression of this work is with individuals. In my work with young leaders, I find many of them have a wire crossed in their thinking, and it often has to do with identity issues. I would like to learn just one thing from you: Did you receive the Spirit by observing the law, or by believing what you heard? Are you so foolish? After beginning with the Spirit, are you now trying to attain your goal by human effort? Does God give you his Spirit and work miracles among you because you observe the law, or because you believe what you heard? We place our identities in so many things other than Christ: our career, our accomplishments, the approval of others, our retirement accounts. Whenever we place our identity in anything other than Jesus, we limit our spiritual growth, because we are trusting in other things besides God. Recent research shows that the foundation for spiritual growth is the belief in Salvation by Grace through Faith. Salvation by grace is not only one of Paul’s basic teachings, but it was the defining belief through which Martin Luther launched the Reformation 500 years ago. Several years of research went into the Reveal Spiritual Life Survey, and the results have been validated by its use in over 1200 churches generating 280,000 individual surveys. Their findings have been published in a series of books. What they have found is the building block of spiritual formation is this belief fostered by Paul and Luther. Until one truly believes in Salvation by Grace, spiritual growth will not happen. In other words, as long as we think we can do it ourselves, we will never grow. Hence the challenge with identity issues. As I do structural consulting with people, I find many crossed wires that interfere with living into a belief in Salvation by Grace through Faith. I even find this among pastors, even those educated in Lutheran seminaries. Four years of seminary training has not unearthed these crossed wires. Counseling often leaves these identity issues shrouded in darkness where they lay in the unconscious. From the subconscious mind they dictate counterproductive behavior. One form of these issues is perfectionism, which can rest on a failure identity. The self-belief is that “I am a failure.” To disprove this, people will extend tremendous effort proving the belief wrong. Yet, paradoxically, every effort to prove the belief wrong fails, reinforcing the feeling of failure. Of course it fails, because we cannot be perfect. People in this structure are strivers, driven to perform at higher and higher levels, and they tend to drive those around them as well. This structure often leads to becoming a workaholic. My father was driven by this pattern, and expected everyone else to be a workaholic as well. As long as we are trying to prove ourselves acceptable, what role does Salvation by Grace through Faith have? In my own life, a structure emerged as a reaction to being around my father’s perfectionism. The message I took from my father’s posture was that I was “not good enough.” This structure is more about achieving in the external world, as opposed to being an internal identity issue. It is a Purpose/Existence structure, where one believes there is an obligation to achieve certain things to pay for taking up space on the planet. Am I now trying to win the approval of men, or of God? Or, am I trying to please men? If I were still trying to please men, I would not be a servant of Christ. This language is a strong condemnation of those who are people pleasers. Especially pastors. In my travels through the Lutheran church, I've met many pastors whose primary focus is keeping people happy. They value harmony over truth, and often sweep unpleasant situations and conflict under the carpet, creating the illusion of harmony. Paul is calling out such behavior as wrong and sinful. Perhaps that is why I never heard a single sermon in the Lutheran church calling out the judgmental Elder Brother in the Prodigal story for his sin. When I read about this phenomenon, I knew it described me. I was constantly worried that people would find me out, that I was not really competent to do my job. Much of my business success was driven on fuel from this dark place. The outward behavior of people in this mode is similar to the perfectionists: Constant striving, motivation from a negative space, pushing others to buy into your strategies, inability to recognize others are free to say no to this compulsion. A third structure that sometimes shows up in structural consulting is a Freedom/Control structure. It is based on a fear of imagined negative consequences, and produces constant worry. It expresses itself through controlling and manipulative behavior that seeks to protect loved ones from the bad things right around the corner. For example, although the risk of getting killed in a car accident far exceeds the risk of dying in a plane crash, we all know people with a fear of flying. For some, they will not fly, which affects the plans and choices of close family members. Each of these structures is a distortion of reality, and out of each comes some form of self-limiting behavior that often sabotages relationships and success. Identity and Purpose/Existence strategies ascribe to the myth that it is possible to be perfect, and to be good enough. Since these issues are often operating below the conscious level of thinking, people don’t realize that they are holding up a myth with all their might. They are so afraid of what’s lurking in that dark corner just outside their view, and the fear of looking in the dark corner is what gives the structure its power. When Rosalind Fritz did my structural consult, it only took a few questions to bring my structure into view. I thought I had been trying to prove myself to my long-dead father, and realized I was really trying to prove myself to God. She asked me, “Is that how your religion works?” With that question, I realized I had been propping up a lie in my subconscious, the idea that I could be “Good enough.” Bringing the structure into the light robbed it of much of its power. Sadly, you cannot just die to such a belief once. I have since found myself slipping back into the structure, but I’m onto myself, and the structure feels like an ill-fitting suit of clothes when I try to put it back on. How does that affect growing towards spiritual maturity? As long as I am laboring in one of these structures I am really substituting myself for God. In the identity structure, the striving is really works righteousness, an attempt through my good works to prove myself worthy to God. Even the idea that perfection is possible keeps us from admitting that we are sinners incapable of winning God’s grace. The Purpose/Existence structure follows the same path, holding to an untrue myth that I could ever be good enough. How can I live deeper into God’s grace if I am still trying to prove I don’t really need it? The Freedom/Control structure is incapable of trusting God for the future. Attempts to manipulate and control backfire because of the push back and resentment of others who aren’t willing to sign on to our structure. In all three of these examples, we are holding up an idol as a substitute for God. In reality, we are trying to be our own little saviors. If I can be perfect, or prove myself worthy, I don’t really need the sacrifice of Jesus on the cross or the gift of the Spirit. I can do this myself. In the Freedom/Control structure, we are trying to hold on to the wheel and control fate, sounds like God’s job. I retweeted something a month or so ago that sums this up. “The difference between you and God is that God doesn’t think he’s you.” If I am going to grow spiritually, I first need to understand that I can’t do it myself. Even the faith to believe in God is a gift from God. As long as I am in denial of God’s role in my salvation, I cannot grow into His grace. All of my efforts go into proving myself, and not into walking humbly with my Lord, doing good works as His Spirit enables me. This illustration from my previous post, 3DM a taste of discipleship, illustrates this point. God the Father pours out his grace on us and we get our identity from Jesus' promise that we become adopted children of God, heirs to the kingdom. As I recognize Jesus as not just Savior but Lord of my life (and there was 20 years between those two realizations in my life), I respond with submission and surrender to His will, conforming my life to His. In grateful obedience, I try to live by God's commandments, recognizing that I am still a sinner and will only be obedient as the Spirit gives me strength each day. Those who are still trying to prove themselves are trying to reverse this. In that scenario, because I try to obey His law, God owes me something. By behaving in a certain way, I can control God's response. The problem is, it never works. For more on identity, see this post: Tempted by the Temptations of Christ. I pray that you will find clarity through Christ in your identity as an adopted heir to the Kingdom. May all the good works in your life flow out of gratitude for what Christ has done and not out of obligation to prove yourself worthy. Amen. Micah 6:8: He has told you, O man, what is good; And what does the LORD require of you but to do justice, to love kindness, And to walk humbly with your God? Watch the trailer linked below for this new documentary. It tells the story of the most famous Sushi chef in the world, who at a very advanced age is still pursuing perfection in Sushi. He says to his son, "You must make Sushi for the rest of your life. You must love your work." Hear the obligation the old man is living under as a perfectionist? Hear the obligation he is putting on his adult son? Is he free to say NO? Is his son? Where do you think they are placing their identity? Do you think God wants to support the idea that we should get our identity from our career?